Alarmed by the huge losses inflicted by British submarines and planes on the convoys supplying Rommel's Afrika Korps, Axis commanders decided to capture their base, the fortress island of Malta. Between 1940 and 1942, several plans were advanced to capture Malta, but none actually carried out. In Island of Death, we looked at the 1942 plan, known as Operation Hercules. 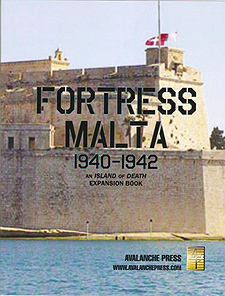 Fortress Malta extends that game to study the plans laid in 1940 and 1941, as well as many variations on the 1942 plan. Historian Davide Pastore has devoted his life to study of the invasion plan, and he reveals its inner workings in Fortress Malta along with Malta's history by David Lippman and Mike Bennighof. There are 420 new playing pieces for Island of Death included with this book, plus seven scenairos for their use. Fortress Malta is not a complete game. Ownership of Island of Death is necessary to play any of the scenarios included.